Blue skies and mountain views. You can’t beat Pegasus Lake on a sunny day – there are 4 kilometres of lake shore to walk around and explore. Kids will love stopping at the various beaches (sandy and stony) to play. Check out the unique suspension bridge, waterfall, and numerous picnic spots. 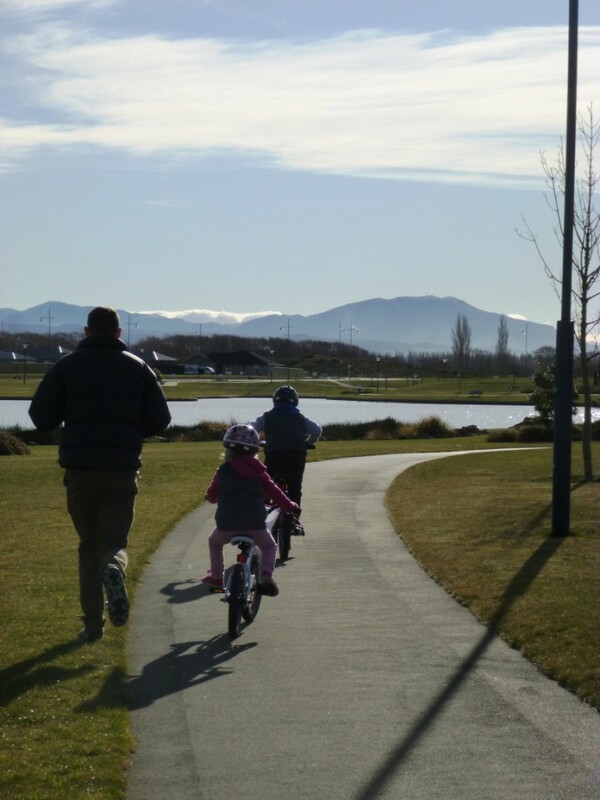 The paths are all wide and smooth, and were perfect for both our novice bike rider and experienced bike rider! We got more pace than we bargained for on this walk. Pegasus Lake is located at the heart of Pegasus Town, which is about 30 minutes north of Christchurch. Just head up Pegasus Boulevard until you hit the shops, then head left (see map below). We spotted one BBQ area and there are plenty of bins around the lake. There are toilets near the car park by the suspension bridge, and beside the new playground. We did this walk in June 2015 (winter). A great spot to stop on the way is Owen Stalker Park in Woodend. It has a playground with a cool train to play on, and a bike track suitable for little bikes. Also, Fanfare, is a must for a look on the way home (see bottom of this page). The Flat White, located at the end of Pegasus Blvd, is a spacious cafe that caters quite nicely for kids. There’s even a separate room set up for families. Get 25% off with your Entertainment Book voucher. The General Store is right next to the Flat White Cafe Bar – get your drinks and ice creams there. As of Christmas 2015, there’s an awesome new playground on the lake shore. There’s also a small playground on the way in/out of Pegasus Town in Blackadder Road. Click on a picture to view in a slide show. Be sure to check out Fanfare at Chaney’s Corner as you head back into Christchurch. 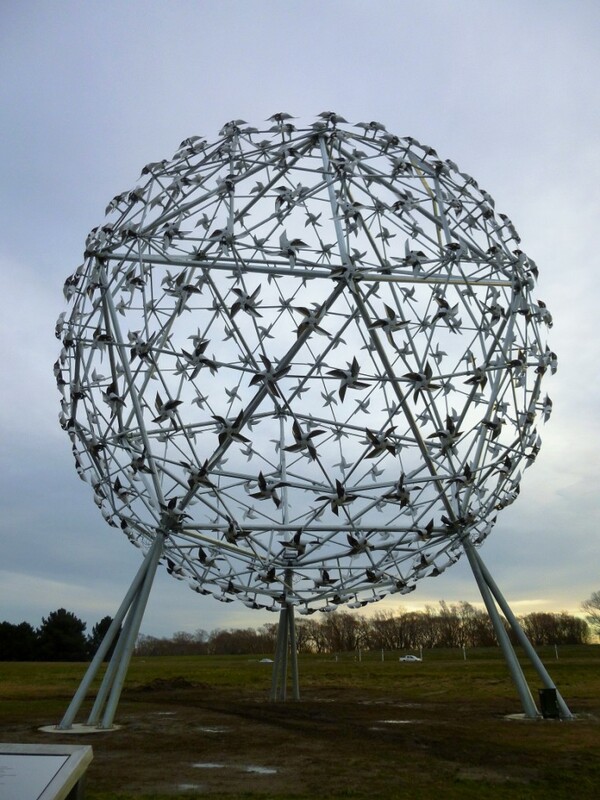 It’s New Zealand’s largest public sculpture – you can’t miss it. There’s parking beside this six-storey high sphere so it’s safe to pull over for a closer look. Pegasus Fun Run – Sport Canterbury. There are 3 distances to suit all ages and fitness levels – I highly recommended this fun run. Mark Sunday 11 October 2015 in your calendar.